It's important to know your measurements when ordering clothing by mail. It is easiest to take your measurements with a cloth tape measure, but if you don't have one you can use a piece of string. Mark the string as you measure and then measure the string with a ruler. Measuring Bust Size: Measure at the fullest part of the bust. Please note, this is not the same as your bra size. If you wear a 34C bra, this does not mean that you have a 34" bust. 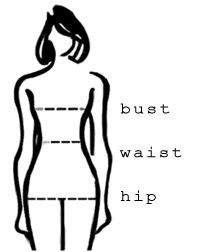 Measuring Waist Size: Measure around your natural waist line. Your natural waistline is the smallest point. If there is no clearly defined "smallest point" measure at the navel line.